Peter M. Brown co-founded the firm with Bob Dawson in 2004. Previously he and Bob Dawson had worked together on cases involving medical malpractice, wrongful death, paraplegia, and serious brain injury. Peter was first admitted to practice law in California in 1970 (now an inactive member) and in Washington state in 2001. He is also admitted to practice before the U.S. District Courts of Northern and Eastern California, Western Washington, and the Ninth Circuit Court of Appeals. Throughout his legal career, Peter has devoted his efforts to serving individuals whose lives have been diminished through the action of government or the carelessness of others. While still in law school he worked in the Civil Rights Division of the Department of Justice assisting African-American factory workers in their employment discrimination trial in Birmingham, Alabama. Thereafter Peter joined a Public Defender’s Office in California where he defended people charged with crimes, but unable to afford their own attorneys. Over a three-year period he obtained acquittals in three homicide cases, including one acquittal based on the rarely successful insanity defense. Peter also handled a death penalty appeal to the California Supreme Court for a man convicted of multiple homicides. Turning to civil trial work, Peter trained with some of the best plaintiff’s personal injury lawyers in San Francisco, and eventually founded his own law firm. His practice focused exclusively on plaintiff’s trial work in the fields of products liability, medical and legal malpractice, serious injuries resulting from design defects, including highway design, and third party construction site injuries. 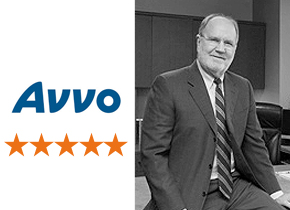 In the majority of these cases, other law firms selected Peter to handle their clients’ cases. Peter has attended the “invitation only” Trial Lawyer’s College at the Wyoming ranch of Gerry Spence, one of the legal profession’s most highly regarded trial lawyers. During this three week program each summer, selected trial attorneys attend intense training sessions in advanced litigation techniques. At , Peter and Bob attempt to employ these skills in every phase of our client’s case in order to assure the optimum outcome for the client. Peter has tried over 50 jury cases to verdict, and has obtained jury awards of over $1,000,000.00 in both state and federal courts including significant punitive damage awards in both California and Washington. Both plaintiff and defense counsel have selected Peter to serve as an arbitrator in medical malpractice cases. Peter now serves as “Of Counsel” to the firm. In this capacity he continues to consult with the firm attorneys regarding the firm’s cases. Peter received his undergraduate education at the University of Heidelberg, Germany, and at Stanford University: B.A 1966. He attended the University of Virginia Law School on a scholarship: LLB 1969. 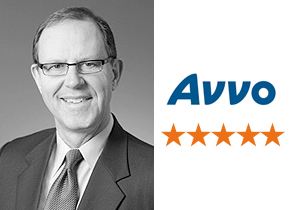 Peter has obtained the highest peer review rating – “AV Preeminent” from the Martindale-Hubbell Rating service. These ratings reflect the confidential opinions of bar members and the judiciary, and attest to the individual lawyer’s legal ability an d adherence to professional standards of ethics. The “AV Preeminent” rating is the highest rating awarded. Peter has been repeatedly selected as a "Super Lawyer" by Washington Law and Politics Magazine following a rigorous process of peer nomination and evaluation by other attorneys. This designation is limited to the top 5% of attorneys in the state. 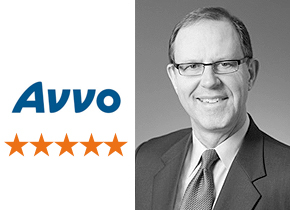 The nationwide attorney rating service “AVVO.com” has awarded Peter their highest rating, a “Ten". "I strongly endorse this lawyer's work. I was honored to work with him on a matter that lasted over several years until resolution. Eventually, though the matter was exceptionally complex, we received an unconditional blessing from the jury! This was no accident, rather the product of diligence, hard work, vision, preparation, and persuasion. Mr. Brown proved himself to be EXCEPTIONALLY capable, thoughtful, and well-prepared. As a lawyer he upheld the highest standards of professionalism and courtesy. Beyond that he is an honest and decent man, the kind you wish to surround yourself with in your life and profession!" "Peter Brown is an attorney whom judges, politicians and other attorneys go to for help when a loved one has been seriously injured. Peter leaves no stone unturned during his investigation and preparation of a case. Once he signs on to being your advocate there is no end to his commitment to obtaining "justice". Peter is a talented and skilled litigator as well as a caring and compassionate person. If you or a loved one has been seriously injured due to another's fault, you will be fortunate if Peter Brown agrees to take your case." “Peter Brown is one of the finest people I've ever met. He, along with his partner Bob Dawson, and Brenda and Courtney, their paralegals have handled my granddaughter's case. She was tragically burned in a house fire and suffered extreme injuries. They have handled this case as though my granddaughter was their own family member. They've been incredible ambassadors on her behalf and have been beyond kind to all of us in her family. They have always taken the time to explain what was happening in the case and answered every possible question. They only take cases that they believe in, and, as their slogan goes, they are truly exceptional lawyers for exception cases. I would add to that they are exceptional people who happen to be exceptional lawyers who only take exceptional cases. They have stood up for the little girl who is the dearest thing in life to me, were successful in making those most responsible for her injuries held accountable, and winning an award of money that she will desperately need as she grows and continues to have surgeries. The purpose of this list is to disclose the experience that Peter Brown has, not to guarantee a result in your case. Please click "here" to read full disclaimer. Hospital Malpractice: $2,400,000.00 Brain injury and death following improperly conducted diagnostic procedure. Medical Malpractice: $1,000,000.00 Settlement for brain injury resulting from medication error, delayed treatment. Construction Site: Bulldozer roll-over - $500,000.00. Hospital Malpractice: $475,000.00. Patient fell from hospital bed when staff used improper restraints. Optometry Malpractice: $400,000.00 – Settlement for failure to diagnose angle closure glaucoma. Client suffered permanent loss of partial vision in one eye. Moratti v. Farmers Insurance Exchange 2009: After five weeks of trial,the jury returned a verdict for plaintiff finding that Farmers had engaged in bad faith and unfair claims handling practices. This was then affirmed by the Washington and U.S. Supreme Courts. We believe the final judgment of $24,500.000.00 to be the highest judgment ever collected against an insurance company in the state of Washington. Medical Malpractice: $726,000.00 verdict in private trial - 2005: Defendant physician failed to monitor effects of medication. Medical Malpractice: Herman v. Estabrook, King County Superior Court, 2001. Client suffered a herniated cervical disk during a chiropractic adjustment. Symptoms first appeared ten days later. Pre-trial offer: none. Result: Verdict of $280,000. Affirmed: Herman v. Estabrook, 117 Wash. App. 1007 (2003) Co-counsel. Employment Discrimination: Zhang v. American Gem Seafoods Inc., U.S. District Court, Western District of Washington, 2001. The client was a Chinese-American seafood broker discharged from employment due to his race. Pre-trial offer: $185,000. Result: Jury verdict for $3,100,000, of which $2,600,000 was punitive damages. Affirmed: Zhang v. American Gem Seafoods Inc., 339 F.3d 1020 (CA9 2003) Co-counsel with Scott Blankenship for trial preparation and trial. Pipeline Explosion: Design defects lead to a gasoline pipeline explosion destroying the village at Canyon, California. Pre-trial offer: none. Result: The Jury awarded substantial punitive damages against Shell Oil in addition to actual damages. Legal Malpractice: Full recovery for an illiterate worker who lost fingers of both hands in a punch press accident. The worker’s attorney for a workman’s compensation claim had failed to advise him of his possible case against the manufacturer of an unsafe punch press. Construction site accident: Wind funnel blew down a concrete wall at a Wyoming mining site, causing brain injury to the client. Peter’s immediate on- site investigation documented unsafe practices, and experts in atmospheric sciences testified the wind funnel was foreseeable. The client obtained a full settlement. Insurance Bad Faith, Fraud: The Client had missed the statute of limitations while trying to negotiate his own claim with an insurance company. Result: The client obtained a settlement of twenty times the amount he originally asked, after Peter discovered documents showing the claims agent and his supervisor had conspired to mislead the client about the statute of limitations. Products Liability – Fork Lift Design: Client lost fingers of the right hand in the chain drive of a fork lift, while riding on the forks. Defendant made no offer to settle, claiming there were adequate warnings, guards, and client had been told to stay off the forks. Result: Substantial jury verdict for client. Skydiving Accident: The client suffered spinal injury after his parachute malfunctioned. Both the jump master and the jump school were uninsured. Result: Peter immediately took skydiving training twice, once at the accident site. While riding in the jump airplane Peter learned of facts which permitted a full recovery against the insured airplane pilot. Peter is an avid blue water sailor, and holds a U.S. Coast Guard Master’s license for sail and powered vessels to 50 tons. His first offshore passage was as a successful competitor in the 1982 Single Handed Transpac sailboat race from San Francisco to Hanalei Bay, Hawaii. Peter sailed an engineless 30-foot ultra light displacement race boat single handed for 2150 miles using only a sextant for navigation. In later years Peter has sailed one and a half times around the world, visiting some of the most remote and inaccessible places on earth, such as the Solomon Islands, the Chagos Archipelago, the Andaman Islands, and Madagascar. Most of the ocean passages were done without crew. In recent years Peter has helped friends deliver their boats to Alaska and California. In over 50,000 miles of blue water sailing, Peter has never failed to arrive at his intended destination. He brings the same sense of determination to his client's cases.